DC Universe’s latest animated film Wonder Woman is hands down the best treatment the character has ever had outside of comics. Granted, that’s not a huge stretch to say. First, there’s not a lot to compare with, especially in light of how often Superman and Batman have bopped around in media. And though fun, the Lynda Carter TV series doesn’t quite hold up as well as Lynda Carter has. But I’ll take it a step further. This is also the best of the DC Universe films so far, the first one that feels like with a couple of minor tweaks, it could easily have been a theatrical release. If Warner Brothers ever gets a live-action movie off the ground, it will have to borrow from the story set out by Gail Simone and Michael Jelenic, because this one already has everything you could want in a Wonder Woman adventure. It also subtly and effectively underscores that Princess Diana’s superhero career has a much different motivation than almost every other superhero hitting the big screen. If the story has a weakness, it lies in a bit of a glossing over of Amazon technology. When Wonder Woman lands in Washington, D.C. in her invisible jet, it does seem to come out of nowhere. Chalk that up to the slightly strict running time imposed by the budget on these animated projects. I’ll believe somewhere in the storyboard stage was an explanation when everything else the Amazons have is strictly in keeping with their ancient Grecian origins. In fact, the movie does a bang-up job of laying out that background in the first five minutes. Queen Hippolyta (Virginia Madsen) and the Amazons cut across the screen in fierce battle with the forces of Ares (Alfred Molina – surprisingly and effectively subtle). It’s savage animation, more violent than anything these projects have done before. When Hippolyta jumps on a harpy’s back with her sword drawn, it took me a moment to register that yes, she’d just beheaded her opponent. 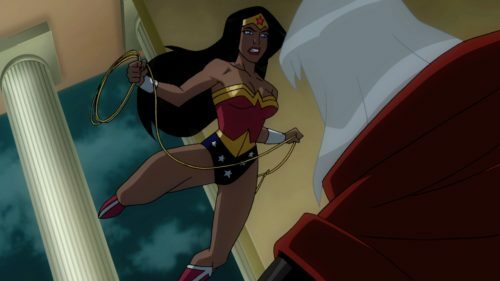 Owing some debt to character design and graphic sequences found in more adult anime, Wonder Woman still feels Western, and a true step forward in making animation just another medium for solid action films. Odd to think that director Lauren Montgomery had earlier been assigned to a quieter third on Superman: Doomsday, because she covers the violence as skillfully as she does the characterization. That’s another reason this is the best Wonder Woman adaptation ever done. Every character really stands out, in ways that aren’t always expected. 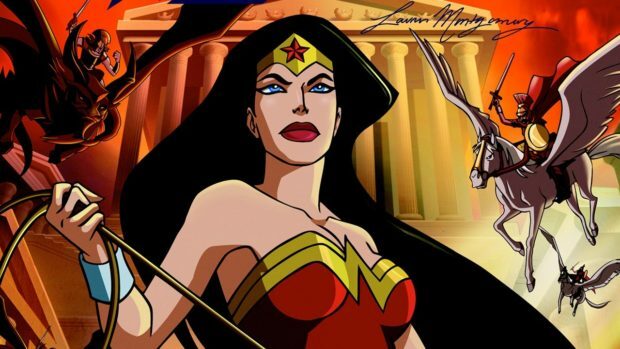 Voicing Wonder Woman, Keri Russell plays Diana’s naivete without coming off as silly or child-like. There’s a hard edge to the Princess that never quite disappears, even as she’s trying to warm up to Steve Trevor. For the first time in, well, ever outside of comics, Trevor feels like a character we might follow in his own right. Nathan Fillion gives him the usual cocksure delivery, and at first, his calling Diana “an angel” seems like a pick-up line, one he’s delivered a hundred times before. But it’s believable to track his realization that she really is special, and if they’re not exactly deeply in love by the end of the film, it’s clear that that will happen. Of course, that golden lasso of truth helps to get him in touch with his feelings. Even the score gives this movie a unique identity. Composed by Christopher Drake, the music has appropriately heroic moments, soaring where it needs to soar. It also, however, doesn’t feel like a retread of Superman or Batman scores, plunking out its own territory. The extras seem almost beside the point, and it’s hard to say whether or not going for the full two-disc special edition would make a difference. 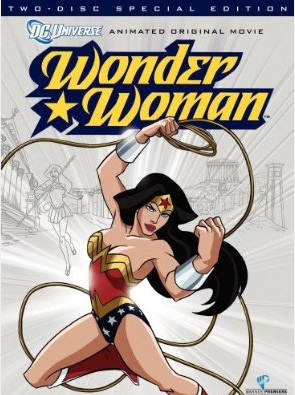 Both discs include background documentaries, which cover aspects of Wonder Woman’s evolution – one in comics (“A Subversive Dream”) and one as the culmination of ancient myth (“Daughter of Myth”). Every one of these background documentaries has been interesting for those who care about history. Admittedly, though, “A Subversive Dream” elides over some of the more salacious parts of creator William Moulton Marston’s psychological ideas about women. This may be PG-13, but there’s still a bit of a family audience to keep enthralled. In addition, there’s a look at the next DVD, Green Lantern: First Flight, that’s included in both single and double disc editions. Montgomery appears to be directing that one, too, which seems to be a pretty sound choice. I’ll admit that I haven’t watched this film with its commentary, but that, too, is a feature on both, and I probably will get around to it eventually. It just speaks so well for itself that right now didn’t seem urgent. I just want to watch the movie again.